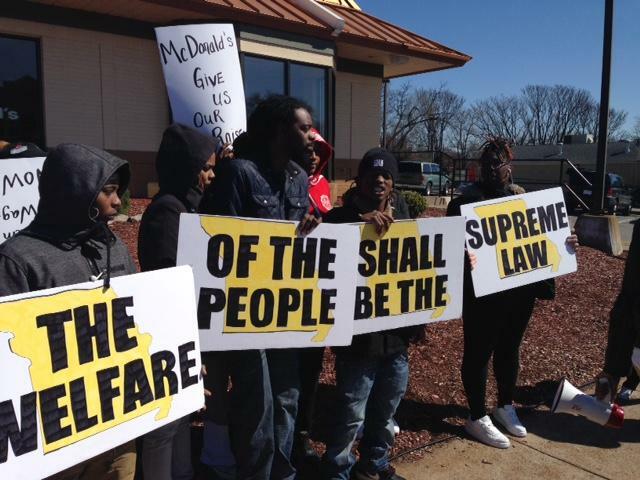 Fast food workers take part in a protest organized by Show Me $15 outside a McDonald's on Natural Bridge Road in St. Louis on March 15. They want the city's $10 minimum wage increase to be enforced immediately. A phone call to one of the attorneys for the businesses was not immediately returned. 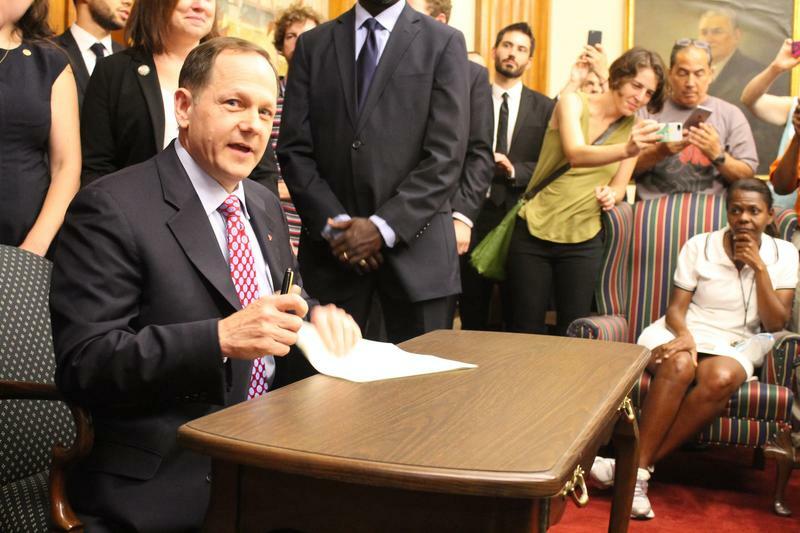 But St. Louis Mayor Francis Slay said he expected the move. “It just delays things, so it gives the state legislature longer time to do whatever it wants to do,” Slay said. The mayor recently has testified before Missouri House and Senate committees against a bill that is moving quickly and would prevent any Missouri city from raising its minimum wage beyond the statewide minimum of $7.70. St. Louis’ law sets the minimum at $10 this year and would raise it again to $11 next year. For now the mayor said the city is unable to enforce the increase because a lower court injunction remains in place, a situation he said is confusing for some businesses and workers. A small group of protesters with Show Me $15 gathered Wednesday outside of a north city McDonald’s during the lunch rush. 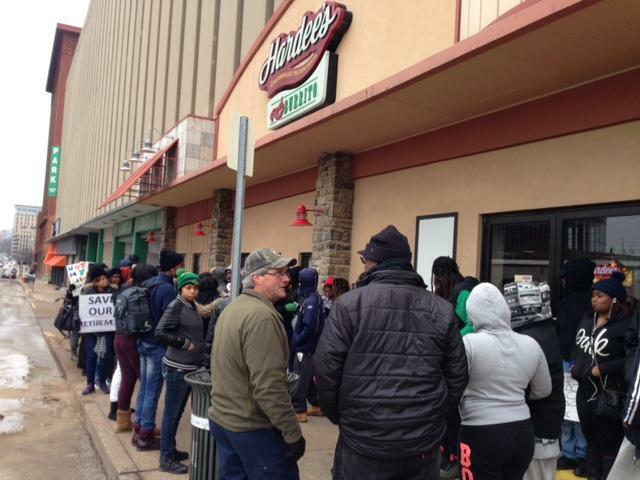 The fast food workers said they want their employers to start paying the higher wage now. Nicole Rush said she works at McDonalds currently for a little more $8 an hour, and often has to choose between which bills to pay each month. The National Law Employment Law Project also released a policy brief Wednesday regarding what it called “interference” by the legislature. It said St. Louis employees had lost out on nearly $35 million in wages since the law was supposed to take effect in October 2015. Updated at 5:50 p.m. Feb. 28 — St. Louis' minimum wage can go up to $11 by 2018, the Missouri Supreme Court ruled Tuesday. Its unanimous opinion ruled that a 2015 ordinance does not conflict with the state’s minimum wage of $7.65 an hour. 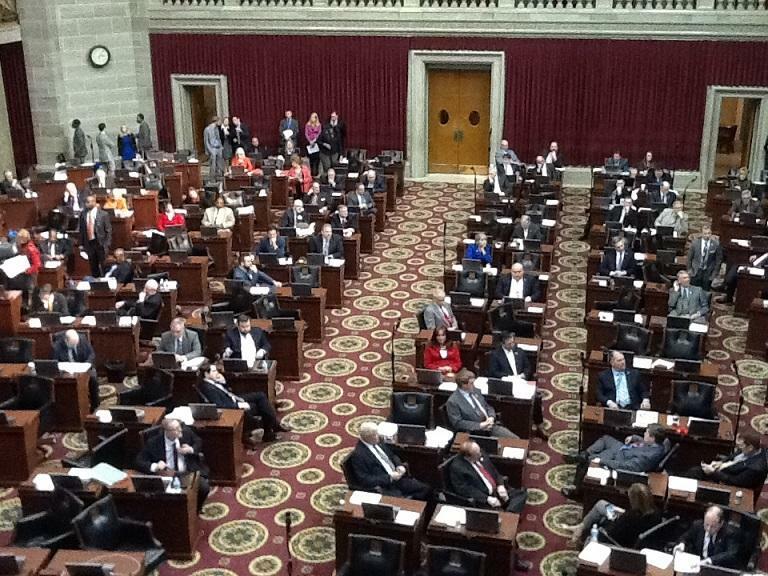 The Missouri Supreme Court is weighing two cases, one from St. Louis and the other from Kansas City, seeking to allow higher minimum wages in each place. At issue is a law enacted during last year's veto session that bars cities from enacting a minimum wage that's higher than that set by the federal or state government. House Bill 722 was passed in response to both cities seeking higher minimum wages, along with Columbia's efforts to ban plastic grocery bags. President-elect Donald Trump’s pick for Labor Secretary, Andrew Puzder, is getting criticism on his home turf. The St. Louis native is CEO of the company that owns Hardees and Carl’s Junior, CKE Restaurants. 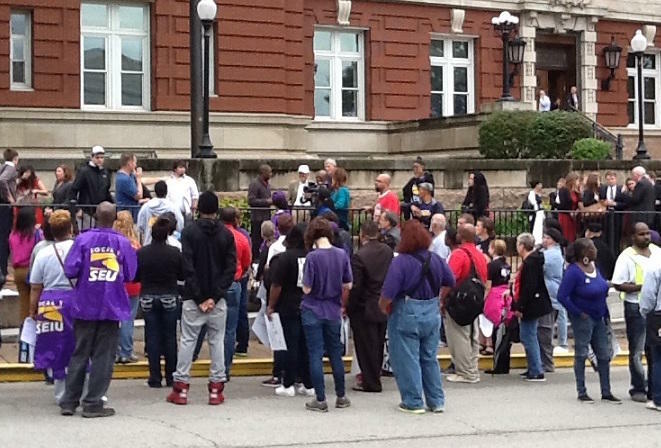 About 50 protesters gathered outside Hardees headquarters in downtown St. Louis on Thursday, questioning whether the fast food CEO would really represent workers’ interests. They then walked a couple of blocks to stand in front of a Hardees restaurant.